What we've found is that being part of the Town Team is a total joy. Giving something back to the community just feels good. 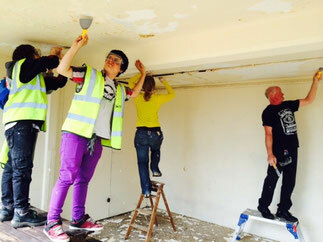 Whether we are volunteering with a large group, to help paint a beautiful mural on an empty shop front, participating in one of our regular beach cleans or litter picks, putting up publicity posters, sitting in a strategy and planning meeting making big plans, or even attending to the sometimes slightly tortuous minutiae of running a project, it's all good fun and each of us does what we enjoy, what we're happy to do and what we're capable of. If you can give an hour, once a year, or from time to time, or if you can make a bigger commitment than that, you can help make a real difference to our wonderful town and we will be glad of your help - so do get in touch. Each project has someone to lead it and other volunteers who get involved in different aspects according to what suits them. The Board of Trustees is made up of a few committed individuals with particular skills. We are all volunteers. You can find out more about us here. We are always on the lookout for new Trustees so if you think you might be interested in finding out about what is involved, do get in touch. What we need is commitment, relevant skills and the ability to get on with the rest of the team. Generally we will invite someone to become a Trustee once we have worked together on a couple of projects and gotten to know each other reasonably well. We're a fun bunch and very keen to have more people on board. You can start by coming to one of our events or get in touch, telling us a bit about why you are interested and what you may be able to offer in terms of time, skills or any other sort of support such as financial or gifts in kind. By all pulling together we can do a lot for our town and it's always a lot of fun too! site by Lorraine Williams, for Broadstairs Town Team, copyright asserted 2014. Broadstairs Town Team is a registered charity and company limited by guarantee, registered company number 091226, registered charity number 1163509, registered address 7 The Broadway, Broadstairs, CT10 2AD.